From the Battle of Waterloo to the Gunfight at the O.K. Corral, there’s no telling how many tragedies could have been avoided had everyone sat down with a bucketful of chicken, warmed up their bellies with a hearty meal, and just talked things out. Historians point to U.S. expansion efforts as the catalyst for this short 1898 conflict between the U.S. and Spain, but they often forget to mention that neither side would bring everyone around the same table, share some chicken tenders and coleslaw, and talk about everyone’s day like they used to. This brief 1801 war, in which the Spanish and French combined forces to invade Portugal, came so close to being avoided. They already had the oranges—all they needed to do was roast some orange and balsamic chicken or whip up an orange blossom pie, grab some sporks, and just solve their problems genially. When a French pastry artist in Mexico City had his shop looted by a group of Mexicans, France put a trade blockade on Mexico, ultimately sparking a skirmish that resulted in more than 230 casualties. It could have all been prevented, though, if the two countries had spent a weekend learning about each other’s cultures at a local farmers market before going out for chicken wings. Many historians see the first Great War as a family affair, as many of the thrones in the warring countries were occupied by the grandchildren of Queen Victoria. Maybe the war could have been prevented if they all would have just acted like a normal family, whipped up some mashed potatoes, and eaten a meal together every now and then. These two Mafia kingpins spent most of the Prohibition era locked in a power struggle over the Chicago underworld. The powder keg finally exploded in the famous St. Valentine’s Day Massacre, where Capone’s cohorts gunned down several members of the Moran gang in the street. However, historians now believe the violence could have been averted if Capone simply introduced Moran to his famous breaded chicken a few weeks prior. This infamous, decades-long feud responsible for 12 murders is thought to have its roots in a dispute between the two families concerning the ownership of a hog. Too bad these folks didn’t realize that had they come together to sell the hog for some chickens, grill a few of those chickens up, and share dinner with each other, we’d probably now refer to them as a singular family unit known as the McCatfields. Pistols at dawn? What about chicken at lunchtime? 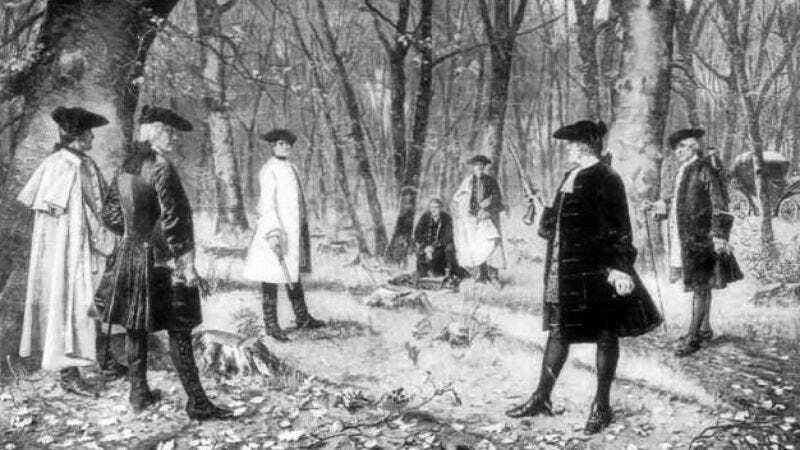 Seriously, these men had a fledgling government to run, and instead they wanted to prance around and shoot at each other. They brought shame on America—a shame still felt every time partisan bickering gets in the way of politicians doing their jobs. If they had just had a picnic instead, we’d all probably be living in really sweet, high-speed space-houses, everyone would have a two-hour workweek, and the only crime would be having too many biscuits before dinner. So, thanks for fighting instead of dining, guys. You blew it. For all of us.